Tens of thousands of LA County Voters, like YOU, are NOT having their Vote Counted and Voices Heard! Our Votes determine Our Futures and the Future of Our Children! We will no longer stand by and allow a small group of incompetent politicians to minimalize Our VOICES and Our VOTES! ... IT’S TIME TO STAND UP ! If you have had any issues that you feel were fraudulent with your voting experience please visit the Bob Lindsey website and fill out his Voter Fraud questionaire so that we all can gather together the best information to solve these terrible injustices! The PEOPLE Will Not Stand By and Not Have Their Voices Heard!! PRINT, POST, SHARE... there's power in numbers! "Los Angeles County Registrar Dean Logan"..."entered the ranks of electoral infamy"
NBC Channel 4 Los Angeles Reports of 3 people arrested in Voter Fraud. (CNN)A random printing error on the voter roster in Los Angeles County caused widespread confusion in the midst of voting in the California primary on Tuesday. Voters whose names did not appear on the roster should have been given provisional ballots. The error could have a major impact on the timing of the results in the state, with an increase in provisional ballots possibly delaying the count for days. The Los Angeles County Registrar-Recorder said that the names of 118,522 voters were omitted from the roster that poll workers use to check in voters at their polling place. ...the man who stole the govern's election...now doing the same thing in Los Angeles." 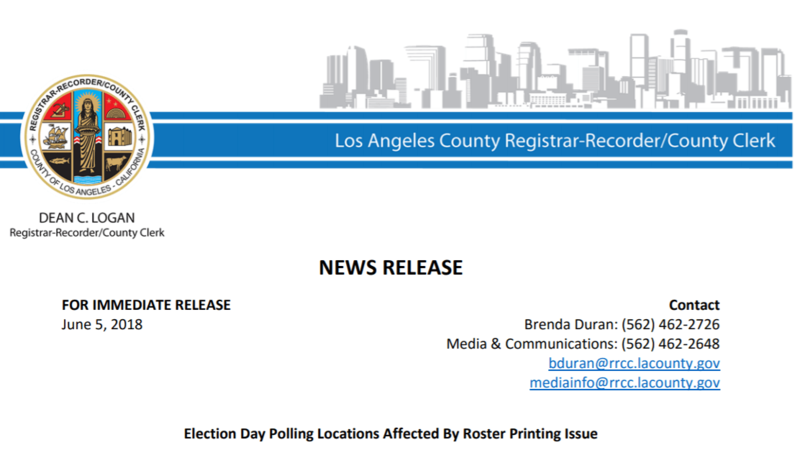 A printing error resulted in more than 118,000 names missing from Los Angeles County voter rolls during Tuesday's primary election, according to the Registrar-Recorder/County Clerk. The registrar's office is emphasizing that all registered voters who are affected by the error can cast provisional ballots that will be counted, if valid. A total of 118,522 voters' names have been excluded, affecting 1,530 of the county's 4,357 precincts, according to an afternoon statement issued by the office. "We apologize for the inconvenience and concern this has caused," said Registrar-Recorder/County Clerk Dean C. Logan in the statement. "Voters should be assured their vote will be counted." Throughout the day, voters complained to KTLA of problems at the polls. "I just got back from voting and had to cast a provisional ballot because my name was not on the list at my precinct, even though I had received a sample ballot. My husband's name was omitted as well," one voter from Glendale wrote in an email to KTLA. "The poll worker already had a list of about a dozen people whose names weren't appearing. A dozen people at one precinct by 8:00 a.m.?" Another voter told KTLA that he, his wife and adult daughter were all excluded from the rolls at their polling place in Arcadia. "We have been registered voters at the same address for many years and have never failed to vote in an election," he wrote, saying his neighbors were affected too. "This is completely unacceptable." That Arcadia voter said he filed a complaint the California Secretary of State's office. Even the Fonz was affected. Actor Henry Winkler, still known for his role in "Happy Days," tweeted that his name was "left off the polling registry" in L.A. About 20 minutes before polls closed at 8 p.m., gubernatorial candidate Antonio Villaraigosa, the former L.A. mayor, called for precincts to remain open longer. Villaraigosa made the demand "because of the unprecedented number of voters left off the voter rolls," he said in a tweet. Mike Sanchez, a spokesman with the registrar's office, confirmed the voting problems earlier in the day but said details were unclear. The office was "still following up on how widespread the issue may be," Sanchez said at the time. Provisional ballots were being issued to affected voters under normal procedure, Sanchez said. A provisional ballot is a normal ballot placed inside of a special envelope before being put into the ballot box, according to the California Secretary of State website. The ballots are counted after an additional verification process that takes place after election day. A provisional ballot tracker on the L.A. County registrar's website allows voters to confirm the ballot was cast, Sanchez said. On average, according to the registrar, 85 to 90 percent of provisional ballots are determined to be valid and counted. There were 5,149,461 people registered to vote in L.A. County as of May 21, according to the state's latest statistics, meaning about 2.3 percent of voters were affected by Tuesday's printing error.